One of my readers (Hello!) asked me about edible weeds, and I realised I haven’t really written anything about tasty weeds. Forage (plants you find in your garden or even further afield) are a great way to supplement your rabbit’s diet. They are free, yummy and much closer to a rabbits natural diet so just what their digestion is good at handling. You must be sure which plants are safe to feed. Some plants are poisonous. Don’t let this put you off though, you don’t have to turn into a botanist, even if you just learn a few common ones you can focus on finding those without having to know lots about weeds. Don’t pick from areas alongside roads or where cars are parked to avoid pollution that settles on leaves. Also avoid anywhere that might be sprayed with weedkiller – so ask before raiding other peoples gardens! And, watch out for places that might be soiled by animals, if there is a lamppost just near a park, chances are the dandelion just next to it might be watered by a lot of dogs! 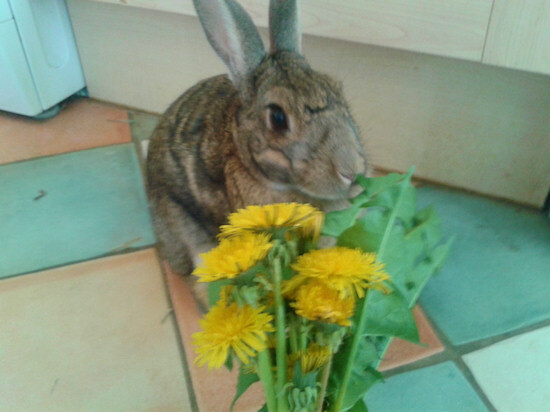 Most rabbits consider dandelions (Taraxacum officinale) very tasty! They are quite easy to recognise, their leaves can look a bit like other plants if you aren’t used to weed ID but the big pom pom seed heads on a single stem are easy to spot. Rabbits can eat the leaves and flowers. Scamp a couple of weeks ago (the reason I had trouble finding dandelions to photograph). Sometimes dandelion can turn rabbit wee orange/red – don’t panic if this happens! 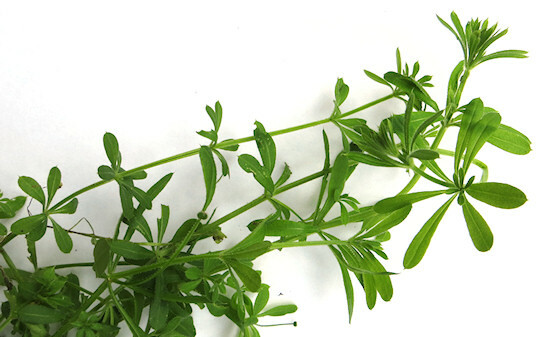 Goose grass (Galium aparine) also known as cleavers, sticky bud, sticky willy or a variety of other common names is very easy to identify because of it feel – it’s sticky. It’s covered in lots of tiny hooks so it will stick to clothing and fur. It’s got short leaves arranged in a circle around long stalks, small white flowers which turn into round stick balls as seed heads, and if often grows wrapped in and around other plants. Rabbits can eat prickly thistle (Onopordum acanthium), don’t ask me how they manage it – I wouldn’t want to chew one, but for ease of picking I’d recommend the smooth sow thistle (Sonchus oleraceus) instead. 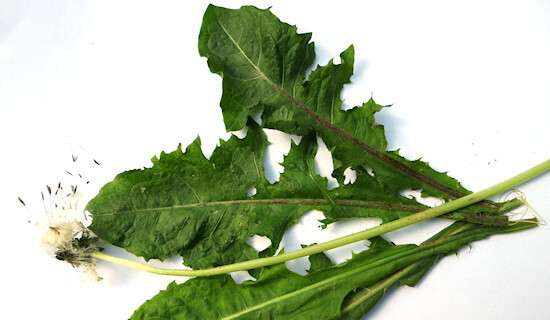 The leaves are a similar shape to dandelion but slightly grayish green (sometimes even purplish as it gets older) and instead of growing low to the ground it grows tall stalks which can be several feet high. The flowers are yellow but smaller than the dandelion and each flower spike has several flowers. One plant that looks similar but isn’t safe to feed is wild lettuce (Lactuca serriola), they are easy to tell apart though, wild lettuce has spikes running down the centre of the underside of each leaf, smooth sow thistle on the other hand is smooth. 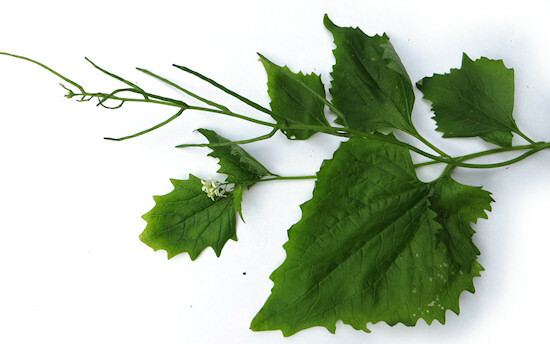 Garlic Mustard (Alliaria petiolata) also know as Jack in the Hedge has quite large heart shapes leaves with jagged edges. The flowers are small and have four white petals each. It also smells garlicky. I only just realised this is what we’ve got trying to sneak in the back of our border – Scamp will be pleased! Stinging nettle (Urtica dioica) is fine for rabbits to eat – they don’t seem to notice the sting. However, it does pose some problems collecting and having it laying around the house (ouch), so unless you are armed with some very thick gloves go for dead nettle (Lamium album/purpureum) which looks similar but doesn’t sting. The easiest way to tell them apart, excluding poking them to see if they sting, is to look at the flowers. 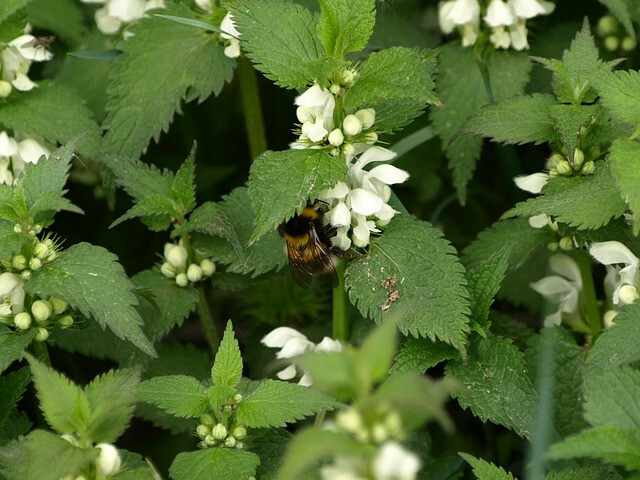 Stinging nettles have tiny sprays of whitish green flowers that don’t look much like flowers at all, where as dead nettles have larger white or purple flowers arranged around the stem. Do you forage or feed weeds to your rabbit? What’s your bunnies favourite? This entry was posted on Wednesday, June 4th, 2014 at 10:43 am	and is filed under Diet. You can follow any responses to this entry through the RSS 2.0 feed. You can leave a response, or trackback from your own site. I also feed my rabbits the leaves of wild grape vines, maple leaves (green ones not red), strawberry and raspberry leaves, apple and pear leaves and twigs. I also grow an assortment of herbs in a pot for them. They love nastursion leaves and flowers and marigold flowers. I’ve a domestic grape vine that Scamp loves prunings from, and the raspberry/apple. It’s amazing how many plants there are you can feed once you start looking. Scamp loves a nice crunchy sow thistle. I haven’t tried clover. Obviously your bunnies are too posh to eat weeds when there are tasty herbs available lol! My buns are particularly fond of plantains, which is great since they’re such a common weed, as well as chicory and cat nip. My granddaughter’s Dutch babies are staying with me for a few weeks while she is on vacation. I apparently have plantain and some white clover mixed in where the hutch is placed. Are these ok? I don’t want them to get sick while I am watching them. Thanks in advance for any help. What about dandelion roots? Are they safe for Jimbob my rabbit as well as the rest of the plant? 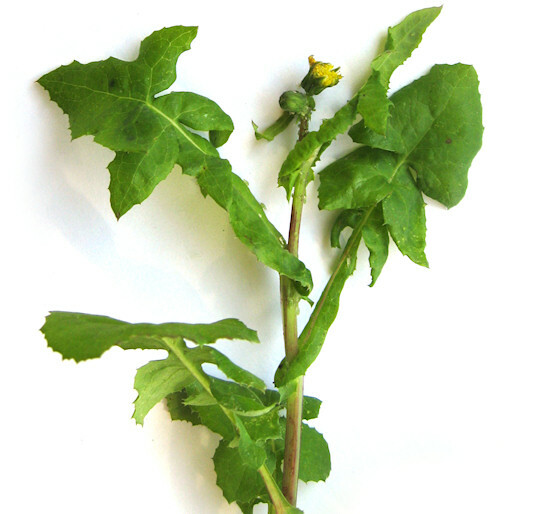 Does anyone know if London rocket is ok for bunnys?Its a weed that has yellow flowers like dandelion yet smaller and lots of them,I have these all over Arizona but cant find info on them?